Petrohradske padani - is it a competition or just an opportunity to meet people of the same kind? We would like each participant to answer this question on his/her own. If the unique spirit of this event comes from every attending climber - not just from our minds - we couldn't be more happy. 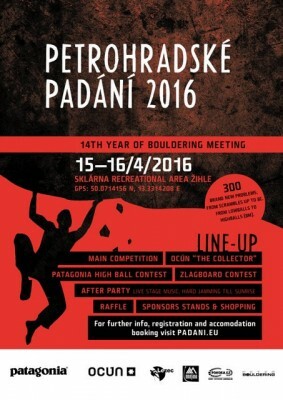 Main Competition, OCÚN The Collector, PATAGONIA High ball Contest, see the „Rules“ for more info. All those competitions take place on the boulders approx. 2 – 2,5 km of walking distance from the check-in site. 8.30 AM – 12.00 AM check-in for the contests still possible. As every year, accomodation is possible in the rooms of the youth recreational area „Sklárna“ . Use of own vehicles/ RVs / tents possible as well. Sleeping in the classrooms possible as well.